Greetings my Liege and welcome to Game of Thrones: Conquest. In this guide, we will cover the basics of life for the Lords and Ladies of Westeros. Your first line of work should be to build your city. You will have several buildings available to construct as you progress through the game and you can learn more about each one and any stats they effect by tapping the icon next to the building’s name. When starting out, you will want to focus on constructing as many Farms and Sawmills as you can, as these will collect Food and Wood over time. Gathering resources will be essential for growing your Army and building up your city. You can also collect resources from crates as rewards along the way, which can be opened from the inventory tab when you need them. Be wary of keeping too many loose resources. Anything above your Storehouse’s protected level can be stolen if you are attacked. It is wise to only open as many resources as you will need at a time. Of course an army marches on its stomach, so extra Food will periodically be consumed by your Troop Upkeep as well. Check the board by your city’s drawbridge to confirm your current Upkeep cost, which will increase with each soldier you train. Protected Food in your Storehouse will not be consumed. With a healthy army, you can venture out to the world map and begin hunting creatures for their resources, crafting materials and other rewards. You can access the world map by tapping the spinning Gyroscope in the lower left of the screen. Each creature on the World Map will display their level and a recommended power level to roughly estimate the difficulty. Power is a general indication of your strength and you will see Power suggestions throughout the game next to a symbol of crossed swords. You can use the Creature Finder to seek out specific types of enemies on the world map. You can also find resource nodes such as Farms or Event Caravans which can be harvested for upgrade materials. Any march you send out will consume Stamina. Additional Stamina can be purchased by tapping the blue plus sign next to your Stamina total in the march troop selection menu. You can also view your Stamina Bar and purchase additional stamina when viewing your profile. Back inside your Keep, you can use resources to upgrade or enhance buildings by tapping the corresponding button when you tap the building. By default, you will always have one Builder available to help with building upgrades, but you can also purchase a 2nd and 3rd Builder using gold to upgrade several buildings simultaneously. 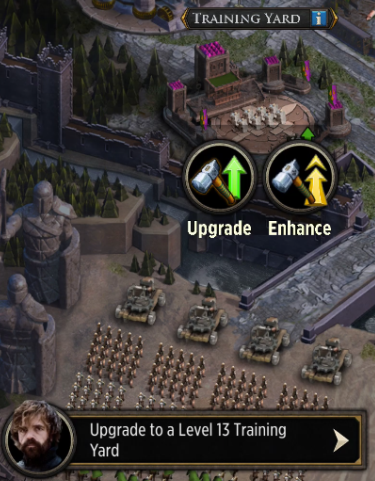 The various buildings in your keep will focus on different benefits as you upgrade them, which you can view by tapping the ‘I’ icon on each building. 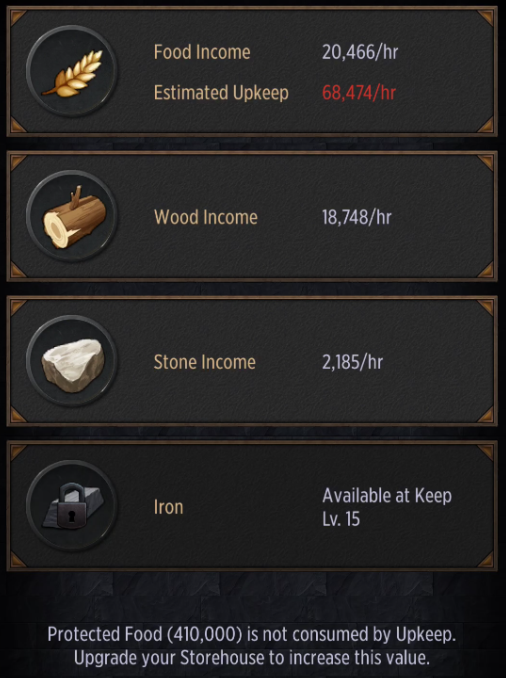 If you are unsure what to upgrade next, Check Tyrion’s Quests by tapping his icon in the lower left of your City screen. You also have several Daily Quests that can earn you rewards each day for completing tasks. Once you upgrade your Keep to level 4, you will be able to construct a Maester Tower. Your Maesters can research new technologies to accomplish feats such as unlocking new March Slots, buffing your army, increasing your resource production, and more! You can also send your Maesters on Expeditions to discover rewards abroad. Similar to Builders, you will always have one Maester at your disposal, but you can spend gold to recruit the help of up to 2 additional Maesters when your first Maester is busy. No strong leader ever came to power on their own, my Liege. You will need some friends to truly conquer the Seven Kingdoms! Game of Thrones: Conquest features an innovative allegiance structure that is truly unlike anything seen before. Recruit up to 5 bannermen who report directly to you. Below them will be their own set of bannermen, who can also have bannermen of their own! This makes for a total of four tiers in an allegiance, with the strongest Liege at the top, and three levels of bannermen below. Each Full Allegiance can have a maximum of 156 participants. Check out our Allegiance Guide for more info on how to successfully manage and lead your followers. Now that you have the basics down, you can work on strengthening your position in Westeros by Crafting powerful Gear, competing in kingdom-wide Events, and conquering a Seat of Power with your Allegiance!